Lodi Gyari, former Special Envoy to His Holiness the Dalai Lama and UNPO co-founder, passed away on Monday 29 October 2018. A key figure in the Tibetan struggle for self-determination and dignity under Chinese occupation, as well as an advocate of human rights and democracy worldwide, Gyari’s impact on international relations is non-negligible. UNPO mourns the passing of this extraordinary man, whose remarkable influence reached far beyond the Tibetan cause to affect the struggles of unrepresented nations and peoples everywhere. In 1949, Lodi Gyari was born in Nyarong, Eastern Tibet; because of China’s occupation of Tibet, his family was forced to flee when he was only ten years old. Once settled in India, he continued his monastic Buddhist education as a recognised reincarnation of Khenchen Jampal Dewé Nyima, from Lumorap Monastery. He studied and learned from both Tibetan and Indian Buddhist masters, whose eminent positions often placed them in contact with their peoples’ respective self-determination movements. As a result, Gyari was exposed to political thinkers and leaders alongside his spiritual and religious training. The combination of the two would prove a fundamental influence on his path in life. In his early twenties, Gyari was one of the Tibetan Youth Congress’ founders; the grassroots organisation aimed to involve young Tibetans in their nation’s struggle for freedom and human rights, as well as promoting democratic ideals. Today, it is the largest Tibetan political organisation outside of Tibet. Although originally an advocate of armed resistance, Gyari progressively recanted his views and became a strong believer in nonviolence and peaceful conflict resolution; he was also one of His Holiness the Dalai Lama’s “Middle Way” policy’s strongest supporters. Working first as a journalist, Gyari was the editor of the first English-language Tibetan publication, Voice of Tibet (now Tibetan Review). He progressively got involved in politics, rising in the ranks of Tibet’s government in exile where he held such positions as Speaker of the Parliament and later Cabinet Member. His most famous position was Special Envoy to His Holiness the Dalai Lama in Washington D.C., which he held between 1990 and 2011. During his time in the USA and as a direct result of his advocacy work, the 2002 Tibet Policy Act institutionalised support for His Holiness the Dalai Lama and the Tibetan people’s right to self-determination. Part of this support came in the form of over $185 million in funds for Tibetans and the Tibetan government in exile, set aside for the purpose between 1991 and 2011. 1991 was a key year for Lodi Gyari. During his first year as President of the International Campaign for Tibet (a position he held until 1999), the United Nations (UN) passed their first resolution on Tibet in 25 years – in great part thanks to his work as the head of the Tibet-UN initiative. It was also the year in which he became one of the founding members of the UNPO. This led him to travel to Baltic and Eastern European countries, among others, as part of UNPO’s commitment to building mutual support between democratic and nonviolent self-determination movements worldwide. On the occasion of UNPO’s tenth anniversary in 2001, Gyari was among the individuals awarded a ‘distinguished service award’ for his commitment to the organisation’s vision and principles. A decade later, he spoke at UNPO’s 20th Anniversary celebration, where he reiterated his vision of the organisation as a “global platform that generates solidarity and collaboration with and from other oppressed peoples in order to make an impact on the global geopolitics and multilateral avenues”. Between 2002 and 2012, Lodi Gyari led the Tibetan government in exile’s negotiations with the People’s Republic of China. Although talks eventually stalled due to Beijing’s refusal to compromise, Gyari’s time at the helm led to the longest and most stable phase of relationships between China and His Holiness the Dalai Lama. He resigned in 2012 due to increasing repression within the Tibet Autonomous Region (TAR) and the Tibetan government in exile’s regime change. However, he continued to pursue other activities including his position as Executive Chairman of the ICT, which ran from the end of his Presidency in 1999 until his retirement in 2014. In his last few years, he was a research scholar in Georgetown University’s Asian Studies programme, while also writing a memoir that is now in its final stages of completion. On Monday 29 October 2018, Lodi Gyari passed away in San Francisco at the age of 69. His influence, however, remains. The Tibetan struggle – and particularly its commitment to nonviolent, democratic methods – has garnered sympathy both in the US and globally. There are rumours of back room talks between Beijing and the Tibetan government in exile. Said government remains a UNPO Member, and is actively involved in UNPO’s work promoting its struggles as well as that of its fellow Members. 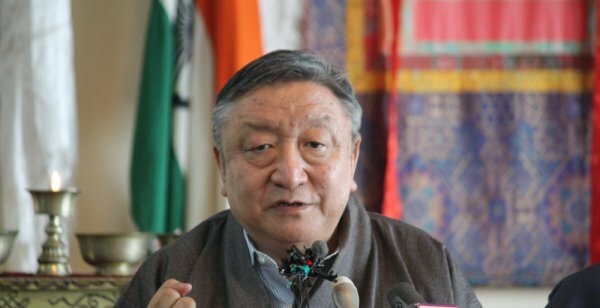 Although UNPO is saddened by the loss of its co-founding member Lodi Gyari, it remains determined to honour his vision and principles advocating for the rights of both Tibetan people and all unrepresented nations and peoples.